My five Shooting Star plants are blooming this week, which means you’ll probably start finding them in Southwest Virginia in the weeks ahead. This perennial plant is made up of a rosette of oblong leaves, each about 6 inches long and 2 inches wide. A stalk (or inflorescence) comes up from the center of the rosette in April and unfurls into a half-dozen or more white or pinkish flowers. The white petals retract to reveal a pointed yellow and brown tube at the the center. The overall effect of this structure is the illusion of movement: the flowers look like little rockets, or “shooting stars”. 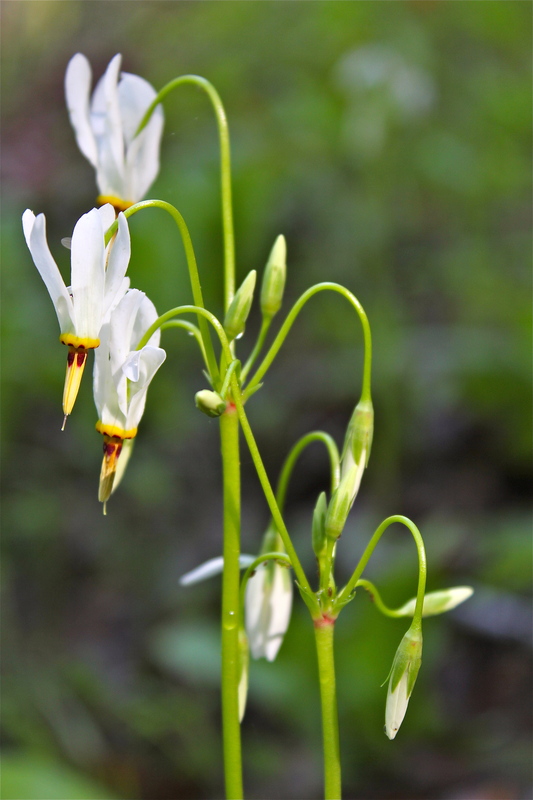 Shooting star colonies often occur on well-drained slopes. This collection of photographs was taken on a rainy day in late April, on a steep hillside near Shawsville, Virginia. 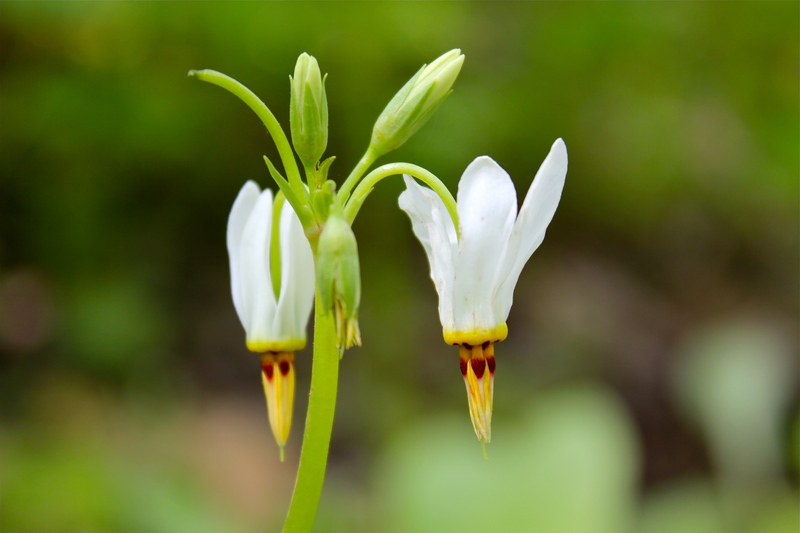 Have you seen any shooting stars blooming yet this season? I’ve kept an eye out for them, but haven’t seen any yet. Any tips of where to see them around Blacksburg? Thanks! Hi Elyse! I have some on my property, just 5 nice plants and they are in bloom. You are welcome to come see them. Let me know and we can exchange email addresses. Some of the ones pictured here are on private property in Shawsville, so I’m not free to take you there myself. I would be you could find some at Camp Alta Mons, because that is a similar site. Let me know if you want to see mine, because they are in bloom this week. Hi Gloria! Thanks for the suggestion and offer to come view them on your property! I’ll have to swing by Alta Mons sometime this week and see if I can spot any (hopefully they would still be in bloom). Do you think they would be on the steep hillslope along the trail close to the waterfalls? If they’re not there, at least I’ll get to see a beautiful waterfall anyway. Thanks again for the suggestion! I’m not sure where they would be exactly. I’ve seen them on rocky hillsides (south facing?) before the trees leaf out completely.